Does Your iPhone Glow in the Dark? 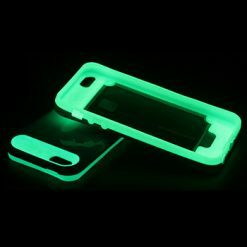 Put an end to those midnight scrambles for your iPhone and illuminate your gadget with a stylish two tone glow in the dark case. Shock-resistant and with a handy debit card slot to make it even more useful, this cool iPhone 5 case will protect your smartphone in style. While it is cool to sport the iPhone5, you still need to put it within a case to protect it from undue damage. There are umpteen cases available in the market but sadly none can match the unique iGlow Case for iPhone 5. Made from silicone and polycarbonate lining the iGlow Case for iPhone 5 is durable and flexible and protects iPhone from shocks and scratches. And that’s not all, its curved outline will give you a better grip on the phone while handling it. And there is a reason why it is called iGlow because it glows in the dark! How cool is that? No more groping in the dark for the phone and you can find it easily in the dark without dropping it accidently. The interior of this case comes with a secure cut out to keep your credit card in. So if you wish to travel with ease, all that you need to do is to take this case along! So what are you waiting for? If your friend has recently acquired an iphone5, here is a perfect gift for you to present. Go on and buy this online right away and start gifting. Product dimensions: 6.4 (H) x 13 (W) x 1.2 (D) cm / 2.5 (H) x 5.1 (W) x 0.4 (D) inches.